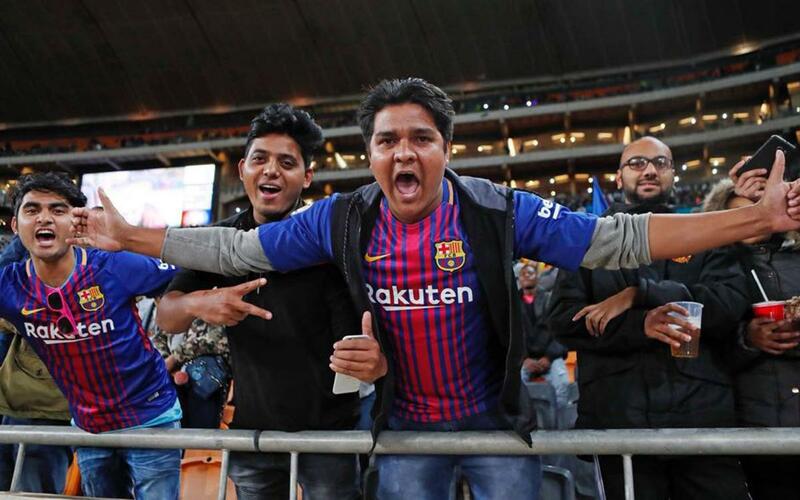 Johannesburg was looking forward to seeing Barça. The most populous city in South Africa enjoyed a real blaugrane festival from the moment the team arrived on Wednesday morning. The fans had been waiting 11 years to see their heroes return and you could tell. The arrival of the likes of Piqué, Messi, Luis Suárez and Andrés Iniesta aroused great expectation at the city’s airport and at the team hotel, the Sandtom Sun. In the hours before the game the hotel organized a meeting with Patrice Motsepe, the president of Mamelodi Sundowns; Antonio Barradas, the director of LaLiga in Africa and the Barça players and party led by director Pau Vilanova, CEO Òscar Grau and first team technical secretary Robert Fernández. During the brief meeting, Motsepe presented the trophy that Barça were later to claim thanks to their victory over the Sundowns. The prize was a likeness of Nelson Mandela waving following his release from prison after 27 years of incarceration. The game took place in the FNB Stadium, the same venue that saw Andrés Iniesta’s goal win the World Cup in 2010. The best demonstration of the effect created by the visit of Barça was just how quickly tickets for the match sold. The tickets were snapped up in just two days with 87,000 fans packing into the ground in Johannesburg. The moment the Barça anthem sounded out, the fans gave the team the warmest possible welcome for a game that South Africa will find difficult to forget.